Finally, with the focus on shale resource plays, wide azimuth surveys are being commonly being acquired. 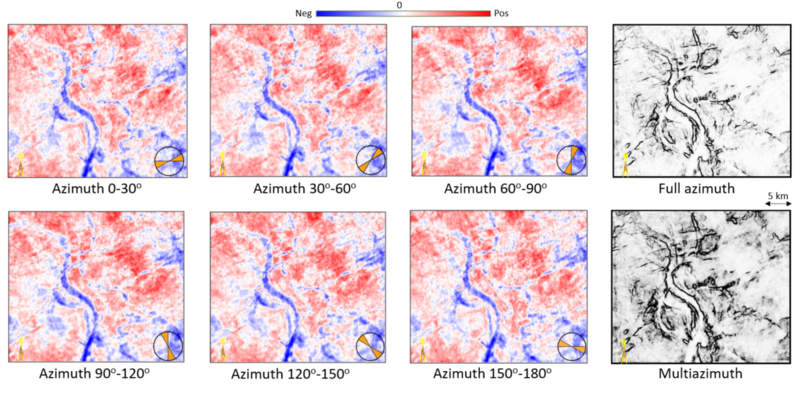 Such surveys provide better quality data in terms of less coherent noise coming from ground roll, and interbed multiples, as well as azimuthal anisotropy analysis. Coherence on azimuth-sectored data has been demonstrated before, and though it exhibits better lateral resolution, it is found to be noisy. Similar to multispectral coherence, the covariance matrix is modified to be the sum of the covariance matrices, each coming from an azimuthally limited volume, and then using the summed covariance matrix to compute the coherent energy (Qi et al, 2017). This computation is referred to as multiazimuth coherence. 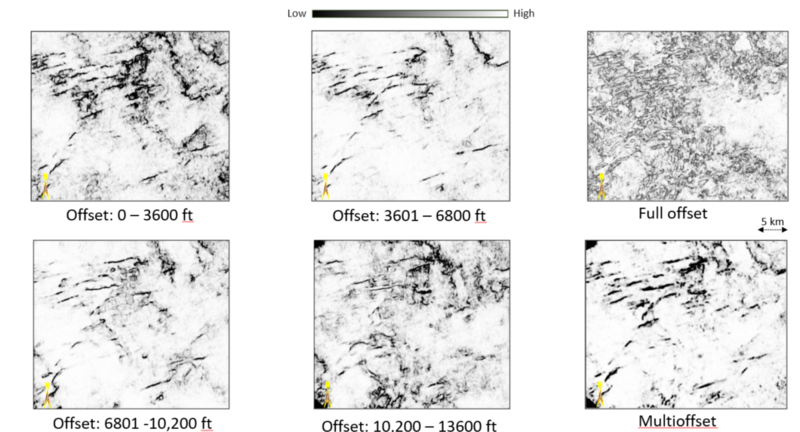 We demonstrate the application of multiazimuth coherence on real seismic data in the examples below, and show the added value they provide for interpretation of geologic features that is always being sought. Gersztenkorn, A. and K. J. Marfurt, 1999, Eigenstructure-based coherence computations as an aid to 3D structural and stratigrahic mapping: Geophysics, 64, 1468-1479. Qi, J., F. Li, and K. J. Marfurt, 2017, Multiazimuth coherence, Geophysics, 82, no. 6, P083-089. Sui, J.-K., Zheng, X.-D. and Li, Y.-D., 2015, A seismic coherency method using spectral attributes. Applied Geophysics, 12, no. 3, 353-361. Marfurt, K. J., 2017, Interpretational aspects of multispectral coherence: 79th Annual EAGE Conference and Exposition, Expanded Abstract, Th A4 11.